Few users have reported problems importing VP3 designs: Sometimes new threads were shown with wrong offsets, corrupting the whole design. This problem was very rare, only happening after designs were written by TruEmbroidery, and other programs are showing the same effect (e.g. Embrilliance Essentials and Wilcom TrueSizer). After incorporating some further minor changes and testing everything thoroughly, you can expect this update somewhere in January. Today people highly rely on ratings and reviews, so please don't be shy to share your opinion if you want to support StitchBuddy's development. Here's a direct link to the corresponding App Store page. If you already left a rating I'd appreciate an updated reflecting the current version. And as I have no possibility to get in touch with a person based on a rating / review: Don't hesitate to contact me directly (e.g. by mail) with any question or problem. 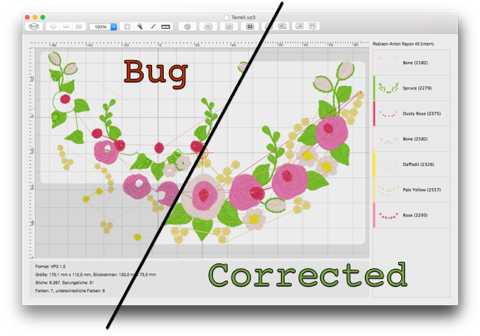 Some moments ago I released StitchBuddy for Mac v2.9.1 as a minor bugfix release: Unfortunately I broke the template (real-size) printing when introducing the new scroll view with version v2.8, resulting in too small printouts. This issue and some minor internal ones are fixed, registered users can download the new release for free. In parallel I submitted new versions of StitchBuddy HD / View for Apple's App Store, with native support of the new iPhone 6 / 6 Plus screen sizes, and a fix of Dropbox syncing in combination with case-sensitive file names. I expect them to be approved in about one week. Update (2014/10/11): I just decided to withdraw both iOS versions and resubmitted v2.9.2 today: the "zoom-to-fit" (by two-finger double-tap) didn't honor device orientations, and I just fixed it. Now the design will always zoomed to the maximum size while remaining fully visible. All StitchBuddy products were renewed this week: With StitchBuddy HD the stitch order of threads can be changed and color changes can be deleted. The Mac version shows a color indicator in the thread list, making it easier to identify colors of small design parts. The overall memory consumption was improved, and some bugs were fixed. More details can be found in the version history on StitchBuddy's website. StitchBuddy v2.9 is a free update for all registered users, and can be either downloaded from the corresponding Download page (OS X), or updated in Apple's App Store (iOS). I posted a video on YouTube, showing some of the new features, and more details can be found in the version history on StitchBuddy's website. StitchBuddy v2.8 is a free update for all registered users of the Mac version, and can be downloaded from the corresponding Download page. By coincidence I found a very valuable resource: "svg2embroidery" is a PHP script by Ellen Wasbø which converts SVG files into EXP embroidery designs. This way you can use the powerful user interface e.g. from Inkscape to compose your design, and Ellen provides some useful tutorials (how to create satin stitches, fill stitches, ...). Once you have created a design and saved it as a SVG file, just visit the mentioned web address, upload the source file, and after specifying the stitch length you will receive an EXP embroidery file in response. Thanks, Ellen! When a file exists on Dropbox, but not on the iPad, and its modification date is before the previous synchronization: It can be assumed that this file has already existed at the last successful synchronization, was synchronized, and afterwards was available on both sides, Dropbox and StitchBuddy. So after the last sync it was deleted on the iPad and therefore needs to be deleted on Dropbox, too. When a file exists on the iPad, but not on Dropbox, and its modification date is before the previous synchronization: The same case vice versa ... the file has already existed at the last successful synchronization, so it was on both sides afterwards, and was delete on Dropbox in the meantime. Therefore it is now deleted on the iPad. As you can see synchronization relies heavily on the modification dates of files in combination with the last successful (!) synch. There were (rare) situations when a synch was considered successful although it wasn't, especially after several retries of file transmissions. Now such synchs will be marked as unsuccessful. In addition the sort order in the folder navigation view was corrected, which was confused by folder names beginning with numbers or special characters, and I fixed a minor issue, when the scroll position was slightly offset after leaving the app from the gallery. Directly after releasing v2.7 users have reported a problem with "barely visible" and unresponsive views on iOS. I had thoroughly tested the app with iOS 7.0 & 7.1 on several devices without even similar issues, and could not reproduce the error ... After a while reviewing recent changes based on some screenshots showing the error situation, I was able to identify the reason. Update your apps for free, either from StitchBuddy's download page (Mac) or in Apple's App Store (iOS). Are you already using subfolders in StitchBuddy's application folder on Dropbox, e.g. as an archive of designs? Please move these subfolders out of StitchBuddy's Dropbox folder before updating the iOS versions. 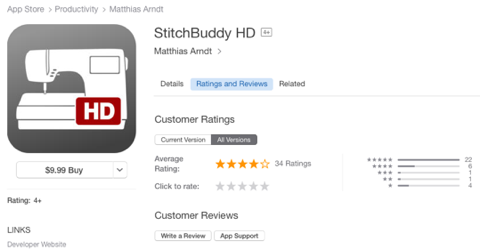 Please share your opinion at Facebook, and support StitchBuddy by leaving a rating / review in the App Store. Starting with version v2.7 StitchBuddy HD / View will support subfolders, including Dropbox synching; here is a short demo of this release, which is announced for March, 2014: Preview of subfolder support on iOS.